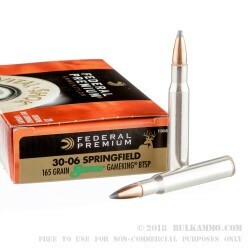 Federal Premium Ammunition’s GameKing line of 30-06 ammunition has earned a well-deserved reputation for dead on accuracy and game-stopping reliable expansion. 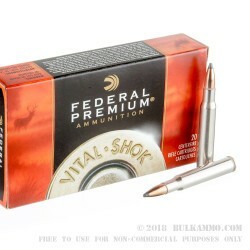 This ammunition is trusted by hunters as one of the most accurate and reliable factory rifle cartridges ever brought to market. 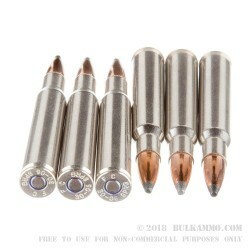 GameKing rifle cartridges are loaded with Sierra GameKing projectiles that are designed with a boat tailed base to reduce wind draft and increase velocity and accuracy. The Soft Point tip facilitates the bullet’s rapid and controlled expansion which results in faster kills with less tracking. Muzzle velocity is 2800 feet per second. Muzzle Energy 2870 foot pounds. 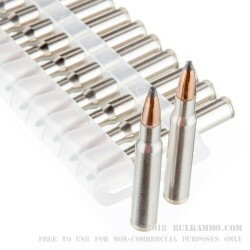 Ammunition is brass case, boxer primed and fully reloadable. All energy was expended in the elk.